GRAFENWOEHR, Germany — Safe student transportation is one of DoDEA-Europe East District’s highest priorities. The following highlights critical school transportation-related safety protocol and measures to keep students safe and prepared for the daily travel to and from their school. LOOK at and KNOW your children’s route to and from the bus stop. SHOW your children how to go safely to and from the bus stop – Use hands-on instruction. Cross streets only at designated crossings; do not cross the street between parked cars. REVIEW the below Five Safety Rules with your children – follow up and reinforce. STRESS good behavior on the bus – good behavior and safety go hand-in-hand. Students must present their bus passes to the driver when boarding the bus. REPORT your safety or security concerns to the school bus office. Children, particularly in Kindergarten through 2nd grade, need your supervision to keep them safe. 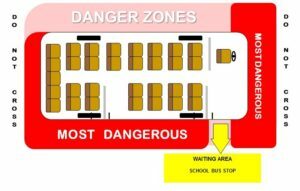 Please take them to and from the bus stop, and wait with them until they have safely boarded the bus. When they return from school, meet them on the same side of the street as the bus stop. Do not wait in a parked car or a building, nor allow your child to come to you after getting off the school bus. In Europe, traffic does not stop for loading and unloading school buses. Teach your children this life-saving rule: Never cross in front of or behind a loading or unloading school bus. Children are at the greatest risk for accidents and injuries going to and from the bus stop. When getting off the bus, take three large steps away from the curb and wait for the bus to depart before crossing the street. Never cross the street in front of or behind the bus.